Note ye ed's email new address: stevebryant99@gmail.com. Josh cracks the gift book display. Learn magic! Be the life of the party! 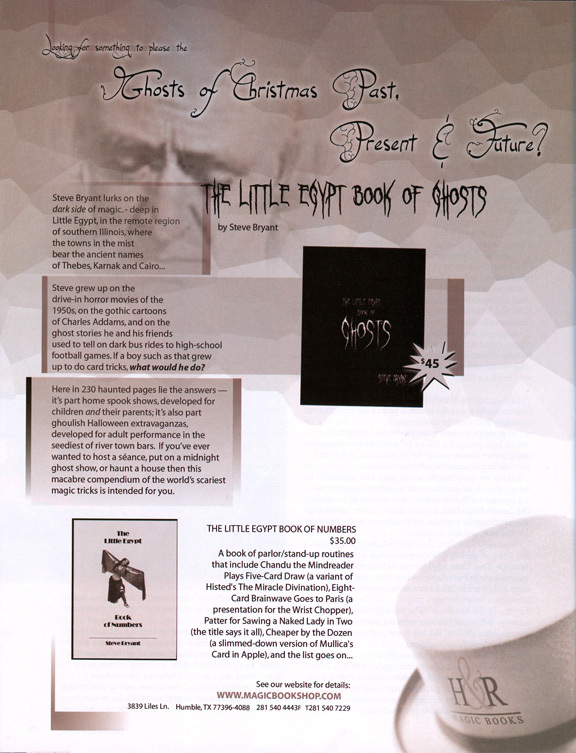 THE DICKENS, YOU SAY -- I've enjoyed seeing the "Ghosts of Christmas Past, Present, and Future" ads for The Little Egypt Book of Ghosts that have so far appeared in Genii and MAGIC. (See below.) Most timely. The book, "ghost written" by yours truly, has left the printers and is slowly wending its way toward the mysterious shed from which H&R Magic Books distributes its wares. I've no idea how long this will take, as the books are traveling only at night in a rickety carriage drawn by six black stallions, piloted by a bat that flutters in the air just about where a driver would normally sit. Your advantage in this slight delay is that Richard Hatch has extended the $40 pre-publication offer through the end of November (after which the book will be $45). Check here for a complete rundown of the contents, if you dare! 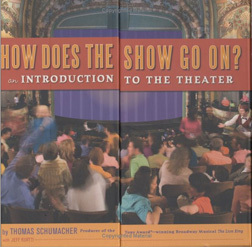 Filled with detailed explanations, captivating illustrations, and entertaining trivia, this clearly written, lively, and uniquely-designed book is a first-of-its-kind introduction to the world of the Theatre, from the box office to backstage, and beyond. From one side of the book, the reader enters via the front door, where the people and activities of the "front of house" can be examined. From the book's other side, the reader enters the "Stage Door," where the behind-the-scenes world of the "Back of house" is revealed. In exploring this visually-inviting "theatre of the mind," readers encounter the people, places, occupations, and equipment of the theatre world, and have the opportunity to investigate them all. From the box office and the Usher Staff to the Dressing Rooms and the Backstage doorman, the reader may wander at will within this one-of-a-kind world, discovering the wonders of theatre all along the way. What makes the book special for magicians is the photo of Jim Steinmeyer's best special effect from the muscial version of Mary Poppins, in which Mary extracts impossible objects from her travel bag. The photo makes the thing look more impossible than I had imagined. The other good news is that Mary Poppins is finally on tour. I look forward to seeing it in Chicago in April. (If you have a Disney credit card, Disney is currently offering buy one get one free.) The 128-page hardcover Disney Editions book is a steal at $13.57 from Amazon. Happy Thanksgiving! As the holiday shopping season is upon us, I can think of no better gift to appease the Ghost of Christmas Present than The Little Egypt Book of Ghosts, which should begin shipping next week. Other items of merit this holiday season include the hefty new Zarrow book, a Joshua Jay introduction to magic, a Disney-esque introduction to the theater, and a new line of Melissa and Doug magic sets. Although not all of the card material requires expert skill (though some does! ), it is all "deep weeds," as an engineer friend of mine says, meaning that it must be read carefully for all its intricate nuances. All who purchase the book will turn first to the chapter on the Zarrow shuffle, where astonishing new insights should open the eyes of both tyros and experts. For those of you who Zarrow under one card (to the disdain of more skilled shufflers who shuffle under a more recommended small block), you may be delighted by the inventor's Double-Cover shuffle, a remarkably deceptive shuffle that may bring the one-card "block" into favor. 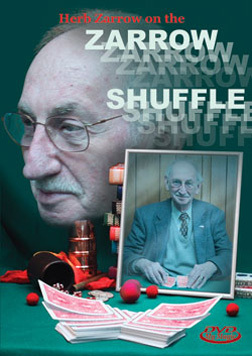 Altogether there are 65 pages of moves, magic, and history devoted to this eponymous shuffle. As to other material I have sampled: Swindle Mates was good enough for Ricky Jay to perform on tv, the Block Transfer is a terrific, rather easy utility move (it devastates in Impromptu Out of This World), and I am completely taken by the ruse employed in Two Mental Cards. What a clever way to get one ahead. I am not being coy in not listing other treasures; I simply haven't finished reading the book. GIFT BOOK -- In an age when most authors of magic books are happy with a print run of 1000 and thrilled with a best-seller run of 3000, Joshua Jay has recently given birth to MAGIC/The Complete Course with a print run of over 70,000! 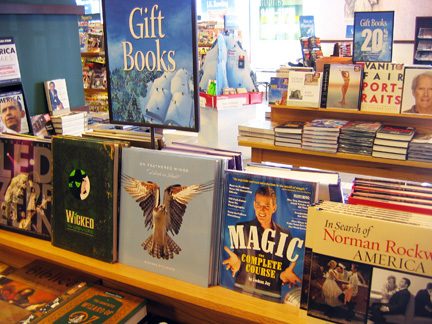 Although it is available in the magic section of any major book store, I am pleased to note that my local Barnes and Noble is featuring it on its holiday gift book display. Most fitting. And if you are lucky enough to live in one of the 21 cities that are part of Josh's book tour, you can see him demo the material in person. This book of 288 pages, over 100 tricks, with 600 photos and a dvd, lists at only $19.95, making it the perfect stocking stuffer for not one but several stockings. 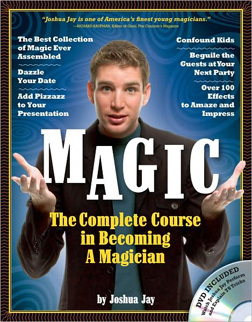 A trick you won't find in the book is 242 2.0, which Josh ran in his "talk about tricks" column in the October 2008 issue of MAGIC (which just happened to feature Josh on the cover). Josh taught me the fundamentals of the trick last February, and it's one of the best (mostly) self-working gambling tricks ever. The mileage Josh gets out of a two-card switch at the end will give you shivers of delight. WOODIES -- For many years now, the Melissa and Doug line of toys has produced quality magic sets for very young children, with nice props made mostly of wood. This year they have expanded into specialty magic sets for somewhat older kids, the line including Melissa and Doug Card Tricks Unshuffled, Melissa and Doug Coin Tricks Unrolled, Melissa and Doug Thumb Tricks Ungloved, and Melissa and Doug Rope Tricks Untangled. I've seen the card and coin trick sets, and they each contain props you would have been proud to own as a kid. All the tricks come packaged in boxes that "fold like a book for easy storage." The card trick set contains, for example, gimmicked decks, individual trick cards, X-ray glasses, and instructions for more than 30 tricks. All are available at Amazon, where you can find deals on individual sets or grouped sets. Sarah and Simon (Vixen and Spike to old Gazette readers) were married on April 1, 2006. You may access their wedding photos at wedding photos. You may view early movies and photo spreads of their charming spawn at Audrey Elizabeth Beverton.